As we move forward into the work of Weighting to Rise the work seems to need a larger purpose, an aspect of the culture that would give rise to such elaborate and lasting funeral ritual. We needed some belief beyond the honor of the ancestor, a god or possibly a sacrificial ritual to honor the god or the dead or both to give the culture a greater depth and the mystery of antiquity. Looking for a solution to what the show was needing coincided to my coming across a passage in Stephen Karcher’s translation of the I Ching. In figure 26, Great Accumulates there is mention of a pure red bull, sacrificed by the king with arrows on behalf of the ancestors that renews the year and opens the fields for planting. The bull seemed to fit beautifully, bulls as gods, animals sacred to gods and as sacrifices to gods are nearly universal in old religions and their stories. Once we had a concept we needed a technique and build procedure. To begin we sought the right bull. Looking at old Minoan mosaic and painted pottery and Picasso’s treatment of the animal we knew we wanted the animal clearly recognizable but just as clearly symbolic. Graffiti and its process is important to nearly every project we undertake to one degree or another. Graffiti is public, you don’t need to be chosen by a gallery or representative to have the work seen, and it has a fierce sort of beauty that is not easily put into a critiquable box. Those qualities give it a sacred and living quality that layers nicely with the fusion of history and technology that we tune into. We really wanted this ancient, sacred image to have that feel. That lead to imagining some of the techniques Gabe has worked with before the Foxy-Wolff, primarily stencils. To reduce an image in all its complexity to blocks of shape and color seemed to distill the animal into a concept, an object and an ideal. Kate and I had a conversation about the need of "the bull" to this body of work. I looked up pictures of bulls and eventually wound up trying to remember my Myspace account pass word. Luckily Kate came to the studio the next day with pictures of bulls that she had found. The printouts were little 5x7 inch on printer paper. I think I said "cool I can work with that. So how big are we doing it?" So taking the printouts to 3x5 foot seamed like a no brainer to me. I would get out the projector and boom done. Kate had that look and I knew that I was wrong. She said to me" I want it like that work", as she pointed to The Crazy Aunt tryptic that hangs in the studio. So The Crazy Aunt is in essence a black and white drawing and it relies on the shadow I love. Needed line vs implied, fine art vs illustration, imagery shapes vs the shapes that should be in place, and so on and so on. Yup, I have a lot. Kate was just so happy about the plan I took it as a personal challenge to see it through. So no projector and no trace paper. Trace paper is how I do versions of The Crazy Aunt and so now what. I guess I'll just have to draw it out. The Bull became three main tasks. Finding the look, life studies, and transferring the image. I did a 8x10 inch cow head drawing in the stenciled look of The Crazy Aunt and we decided that it needed to simplify a lot. The shapes of the cow head got five colors in very specific areas. Picture in your mind a black and white cow head. Now assign a grey scale to just the most important parts (eyes, nose, etc.) and the light the cows picture was taken in. Then I make up shapes that work best fit the drawing versus what's really there. Second step is life study applications. Like in any sketch of a flower arrangement from across the room or the architecture of a building, proportion is the name of the game. I can think in step one and two at the same time and so I just started drawing The Bull. I taped butcher paper down to Kate's desk and started my crazy process. When the drawing was finished and we both liked it I had my wife come over to the studio and color up The Bull. Black was black, white was white, and browns and reds filled in the rest. After completion of the drawing, Gabe prepared a butcher paper trace of it, sort of a paint by numbers thing with all the shapes clearly defined and each of the colors assigned a number value. After some discussion on the depth of the back ground we settled on a total of seven colors, two separate colors on layer two so that areas that touch would not be the same color for different objects. After the complex generation of the image, the build was fairly straight forward, if not simple. The trace was used as a layer guide. 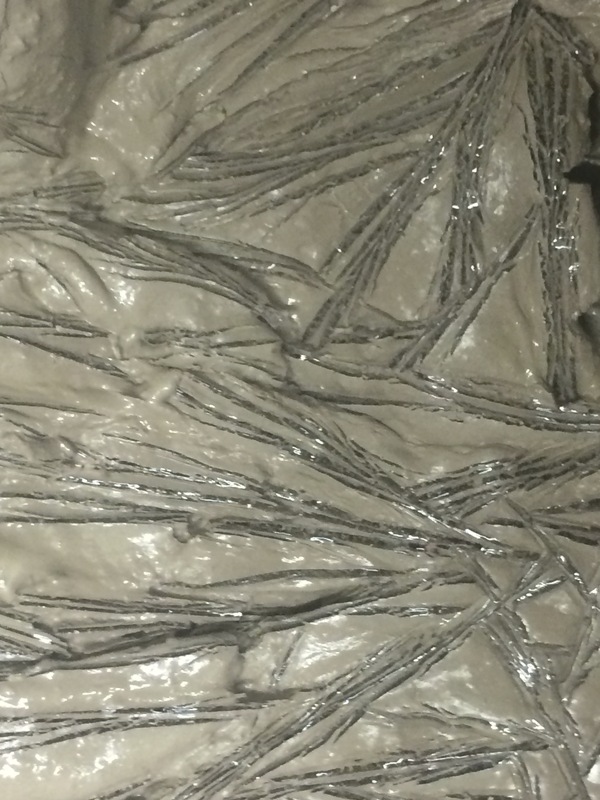 After cutting out a layer, it was cut off the parchment and used again to trace the next layer and so on. The parchment was a genius innovation, trace goes to crap the second it touches wet clay, it can handle no water at all. The parchment, because it’s design for food preparation, it held up beautifully throughout creation of all 6 layers to a tile. Our first step of the build was to make the slabs. Layer one was 3/8″ deep and all succeeding layers were 1/4″ slabs. This took a good deal of forethought as we tried to estimate the number of whole square inches each layer of the 10 tiles would need. It also began to indicate just how massive the project was going to be. While I prepped slabs, Gabe prepared the drywall. Four new full sheets were purchased that week and all would be used in both the easel and the build. 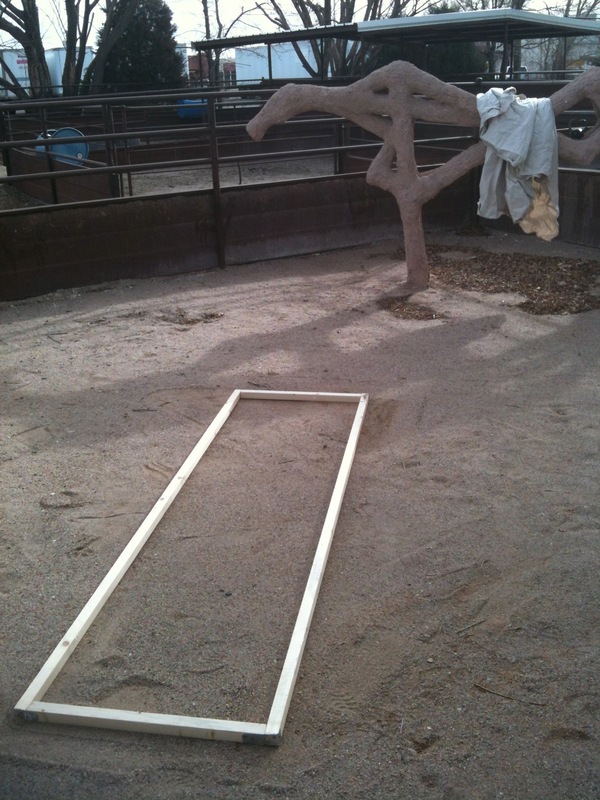 Breaking the bull down into manageable chunks was another discussion that we gave much time. The debate focused on the joins of the tiles. Each of the four or five possible options we discussed had merits and drawbacks, in the end we chose the one that would make the initial build more simple but the assembly on tile board more complex. A basic grid was layer overtop of the parchment drawing with the horizon line at greater than 50% to help keep the heavier tiles to the top smaller. Gabe built a heavy oak frame from old hard wood flooring that both kept the build as precise as we could make it and to slow drying from the side of the tiles. The easel has two drywall layers, also to prevent too speedy a dry time. The bottom layer is a full sheet and the top cut into the exact size of each tile so they could be assembled on the tables and placed back into the frame exactly where needed. Finally we were ready to begin. We chose the Fourth of July weekend for the build because we wanted it done with no large gaps in making process, we both work outside the studio. Aside from a Gabe having to do some small maintenance for the farm, we had four full days to get it done and we needed every minute of it, with very little time even for sleep while we were at it. The actual tiles are deceptively simple. We assigned each color to a layer, where that color shows in the drawing the layering stops and that color shows through. Where white (the background color) shows, the tile is only one layer thick, where white for highlight shows, on the horns and the nose, the tile is 6 layers thick. Where a higher numbered color will show, all layers but be beneath to build the correct strata for the overall piece. As mentioned above we mapped this out by cutting each color from the parchment map on the tile, allowing only the areas where we would continue to build presence on the growing tiles. Tile 4, by far the most complex as it held both the horns and the face took 8 hours to complete. The average time per tile was about 5 hours. First tiles are cut out and assembled, then taken back apart and the slips added to the pieces where needed. After some dry time we reassembled them with slip to bind them together and placed into the easel. After completing all ten tiles we wrapped them heavily for a week so the attachments could solidify and the slips could set. At the end of the week we opened it up and touched up color where we made mistakes and where the slips were not as crisp as we intended. Now fully complete the bull will rest under plastic 6 to 8 weeks to dry slowly to prevent the tiles warping. 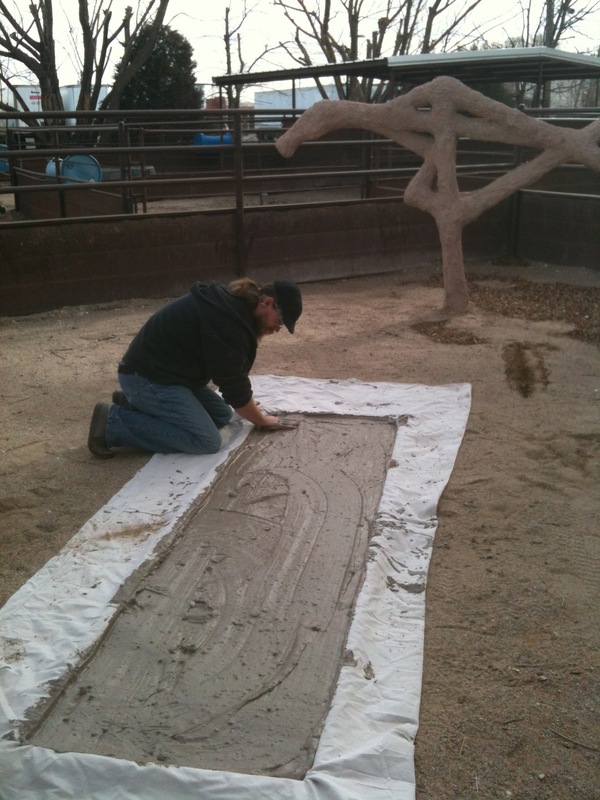 Once dry, we will place the tiles on wasters and fired to 01 to fully develop the terra-cotta color that is the primary color of the finished bull. 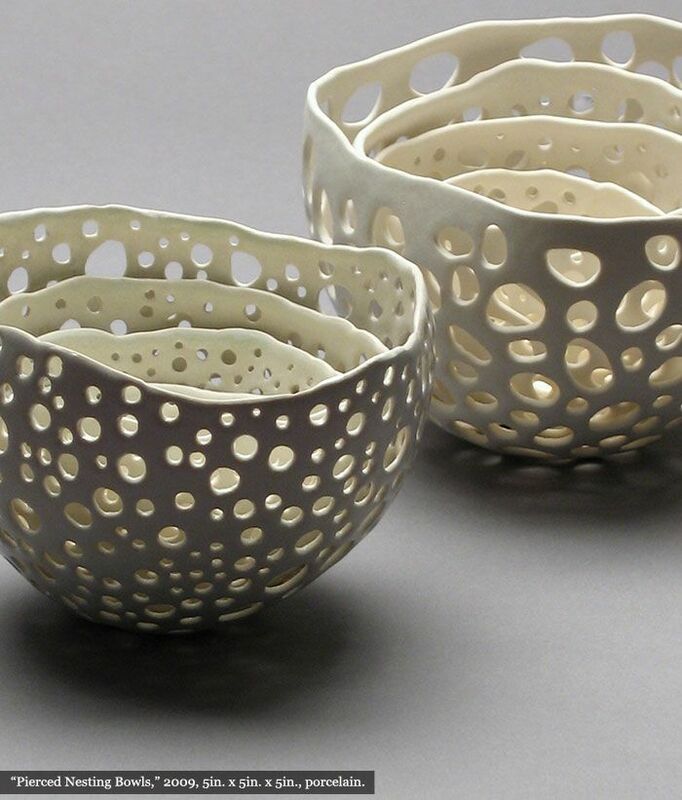 These pinch pots, by Kate Tremel, capture exactly what I love about pinched forms. Delicately crafted, the rims become landscape and describes perfectly the action of the fingers in making. Simple glazing accentuates the directness of form. 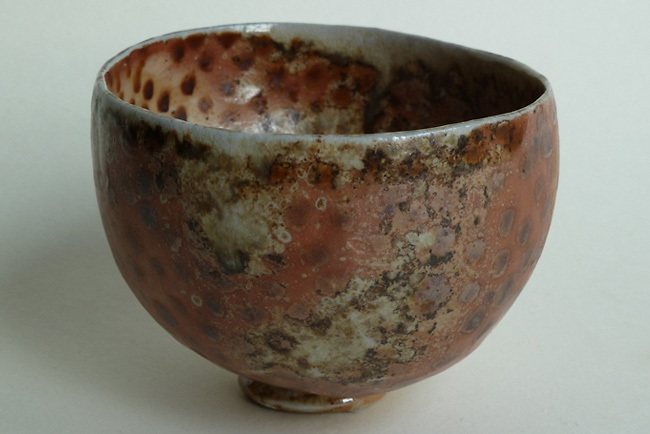 The only addition to these wonderful bowls, is subtraction in the form of pierced openings in the clay wall which allows the element of light to play in the object in a way that is difficult to achieve in clay. 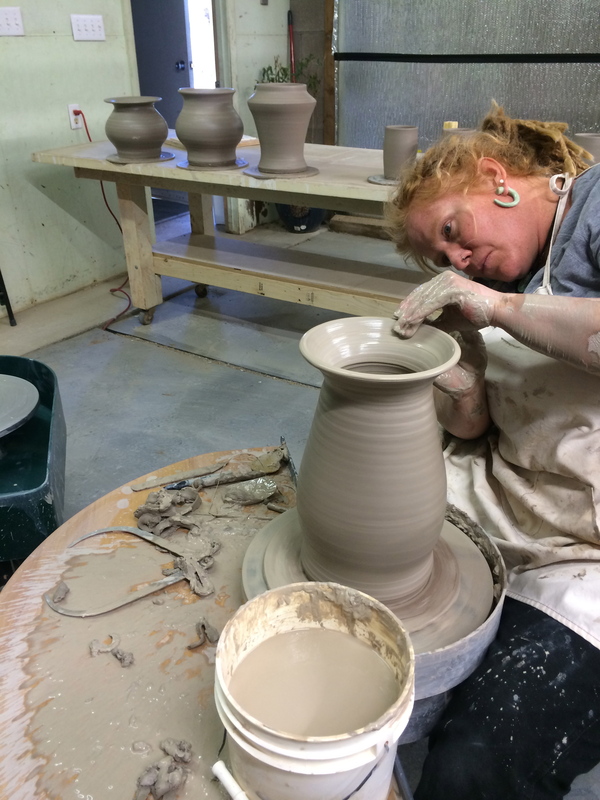 Simple is truly the defining characteristic of pinch pots, while it is true that making a pinch pot is relatively easy, that makes it all the more challenging to make work that displays innovation and integrity. One artist who does that perfectly is Priscilla Mouritzen, South African born and living in Denmark, Priscilla’s wood fired pinched forms are some of the finest pots I have ever seen. The quiet simplicity of form coupled with her rhythmic decorations and the touch of the wood kiln, make each bowl feel like a precious individual. Especially for my students, here’s a nice video done by Ceramic Arts Daily that gives a good beginning on the basic technique and suggests a direction to expand. 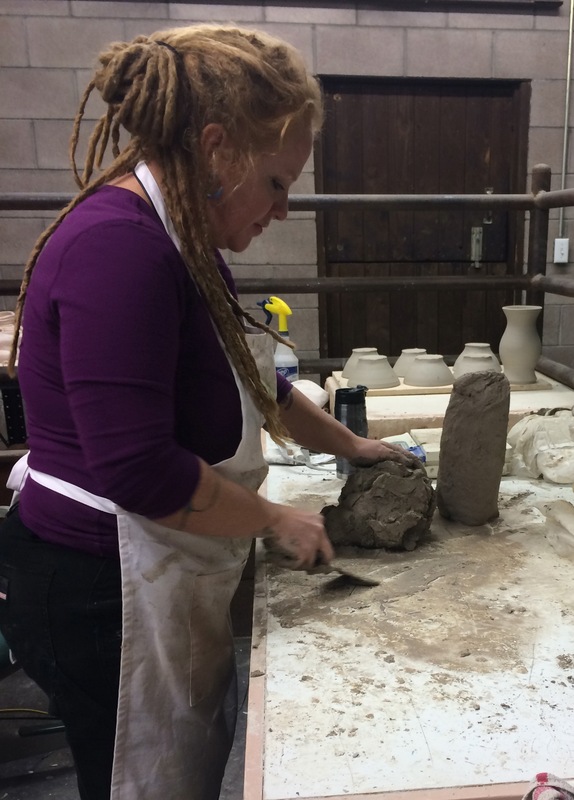 As we began preparing for classes one of our top priorities was to get clay. We are pretty young as a studio and so many of the things basic to a studio need to be acquired. We’re also as a pretty young business and we don’t have a lot of capital, so getting what we needed on the cheap was another priority. Fortunately we had two resources to pull from. From my former business we had about 400 lb. of a clay body called 200. This clay is a brick body from the local manufacturer that my ex-husband and I would screen and mix into a workable throwing body. We also had about 400 lb. of soldate 60 scraps left over from previous sculpture projects. The soldate is a Laguna Clay body with a 60 grit sand, it is a fantastic hand building body. On the surface this is a simple solution to our needs, but the condition of all that clay was nowhere near usable. The 200 had been bagged in 30 lb. lumps that dried out completely, The body is very open because of the brick grog and so has a much shorter storage life than other clay bodies. So that is where Gabe began, taking those large heavy blocks of clay and breaking them apart and then crushing the bits to be slaked down in water. The clay was allowed to soak in the water for a few days so that it could be totally saturated. 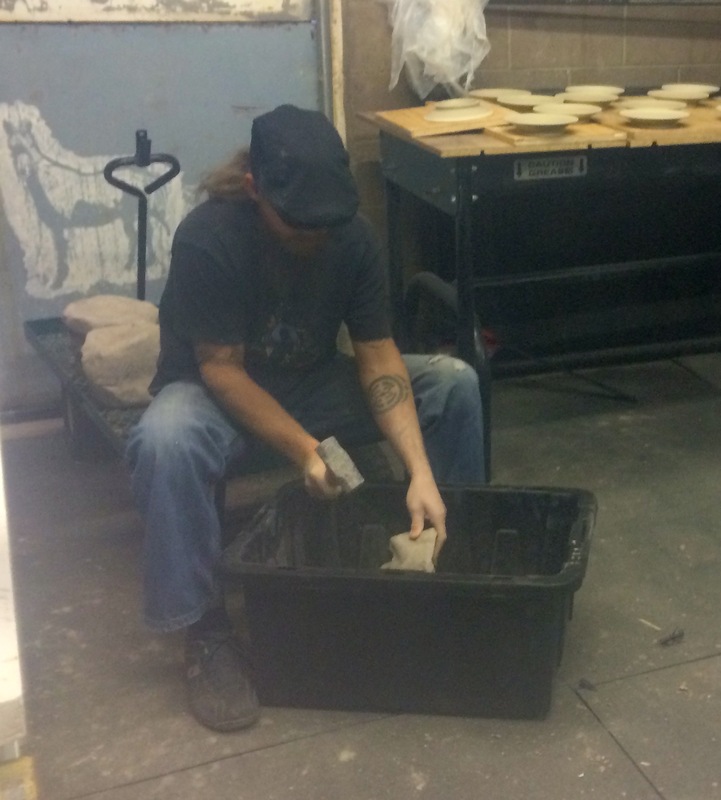 Gabe then put together a drying frame to prepare the clay for mixing. The frame was 2×2’s and a large piece of canvas. 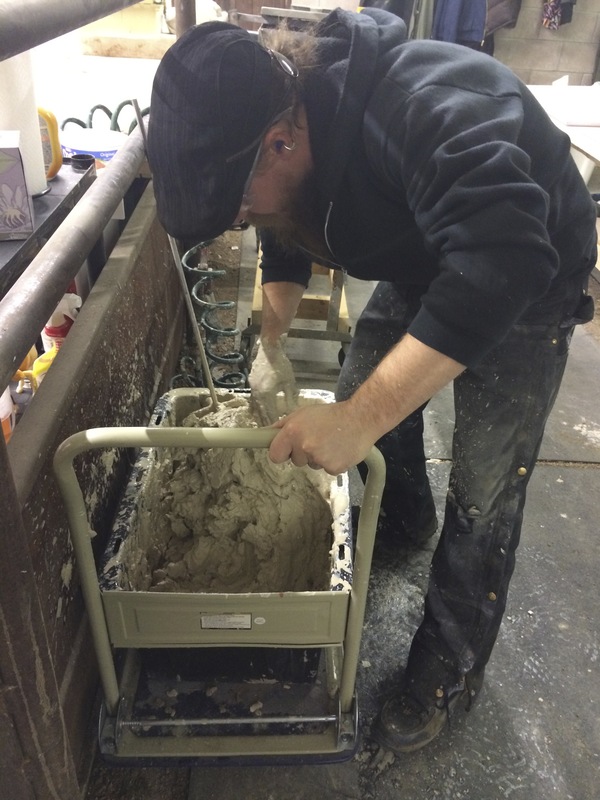 This size was needed so we could get it through the door, the wet clay should not be allowed to freeze as it pulls the moisture inside to the surface, making the clay a slimy mess. 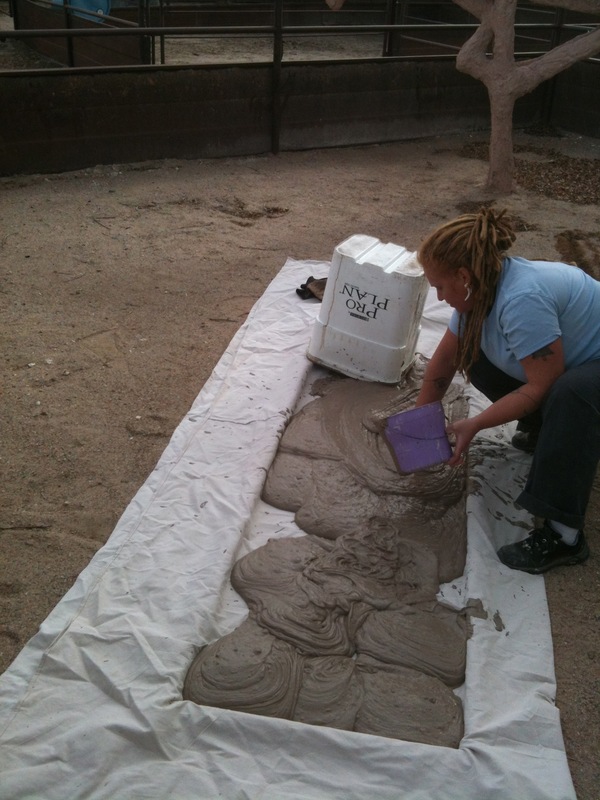 We filled the drying frame with the slaked clay in batches of about 200lb. Once the 200 was bagged and waiting, it was time for the soldate. Gabe’s job here was not as tough as the soldate was in slightly better shape. Some did have to be slaked down, but much of it could be mixed straight from the scrap bags. 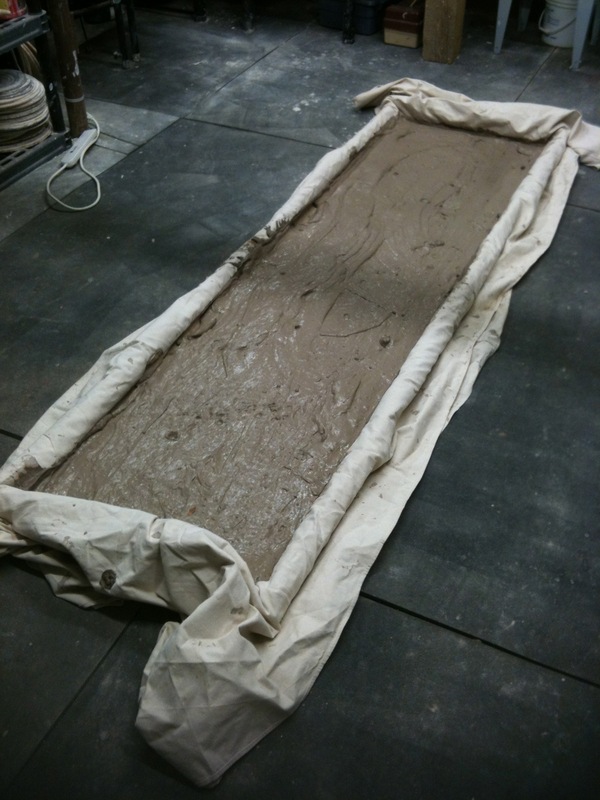 It did all need to be weighed as the plan for the new clay body was a straight 50/50 mixture. One the soldate was prepped and bagged we were ready to begin mixing. 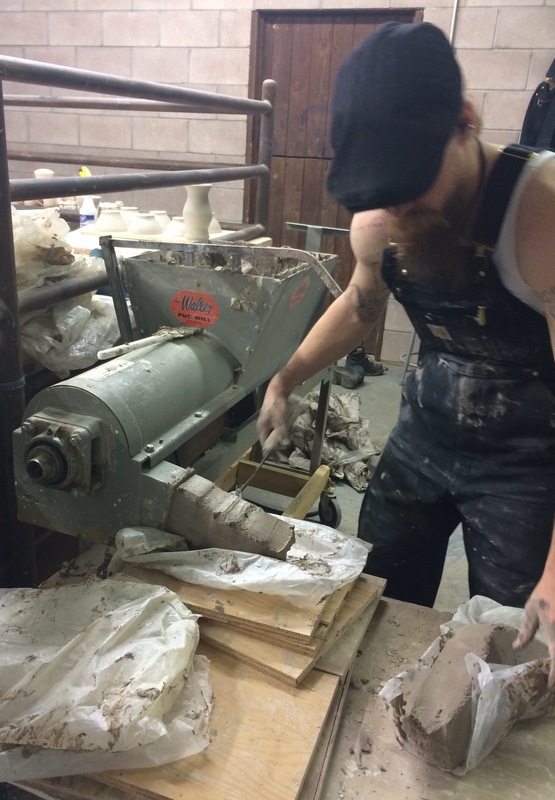 The pug mill was loaded with about 150 lb. at a time, 75 of 200 and 75 of soldate. An even mixture was a priority so the clay was run in 4 batches and then bagged again at 25 lb. He then re ran them through again, one bag from each batch. As the batches ran, it was my job to weigh, wedge and bag the clay. Once the mixing was finished it needed to age, though we were forced to use it for classes right away. After waiting a couple of weeks I sat down at the wheel to give it a try. This is a 10 lb. pot, the clay is still young, but aging into a great clay body. 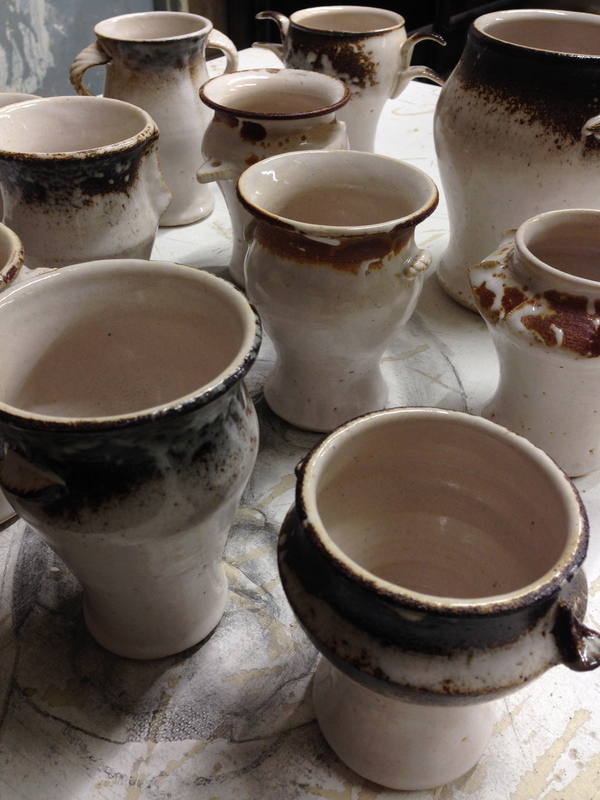 and here are some small vases for the same project, more words on this to come.